Tamworths are a heritage breed, which are well suited to the type of environment we have for them. They do very well outdoors and love to root for tasty treats in the fields and woods. Our sows are exceptional mothers and are gentle and even-tempered. We only sell purebred Tamworths as breeders and they are registered with the CLRC. 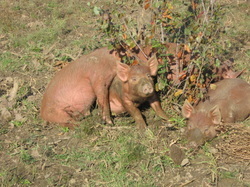 We don't have any pigs available for sale right now but we are expecting more litters in the fall. These little cuties were born in August 2015 - one litter was even born outside in the woods! We only keep the best pigs back for breeders and our nicest (and prettiest!) breeders were born right here on our farm - Willow, Walnut and Buttercup. All of our animals are tattooed and registered with the CLRC.